I've noticed something about the filter option in the v4.0.0.2 of Emby. I'm not saying it's a bug, it may be the normal behavior but I want to confirm with you. When you have multiple versions of the same movie (let's say a 1080p and a 4k one), the filter feature does not handle it. 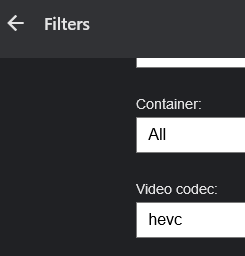 Go to "Movie" and filter only on HEVC for video codec. Results : The movie Venom - 2160p - 10bit.mkv is not displayed. 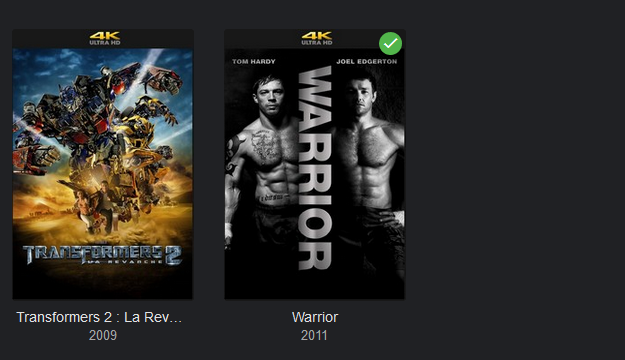 It seems that "filter" only takes into account the "default" version of the movie which seems to be the last one you added. (I'm not sure about this behavior, i'm only sure about the results explained above). I can post the logs but I could not find anything relevant inside. Edited by Okeur75, 22 January 2019 - 08:49 AM. @Happy2Play can you reproduce this? I know it works on Episodes, currently don't have any HEVC movies to test with. Will grab some test files from http://jell.yfish.us/ and test on Movies. I don't even get a HEVC codec option when I have multi-version movies, library with nfos and library without nfos. I guess I would have to correct my comment on episodes as I only have one version of the file. So HEVC is seeing in a single file environment. Tested single file hevc movie and filter worked. This would appear to a default item issue when it comes to multi-version items as mentioned above. Yea i can see how this would happen for movies. thanks. @Luke So you confirm the behavior or do you need anything else on my end ? Is it the expected behavior or will it be patched in a future release ? It's something that needs to be improved, yes. Thanks.